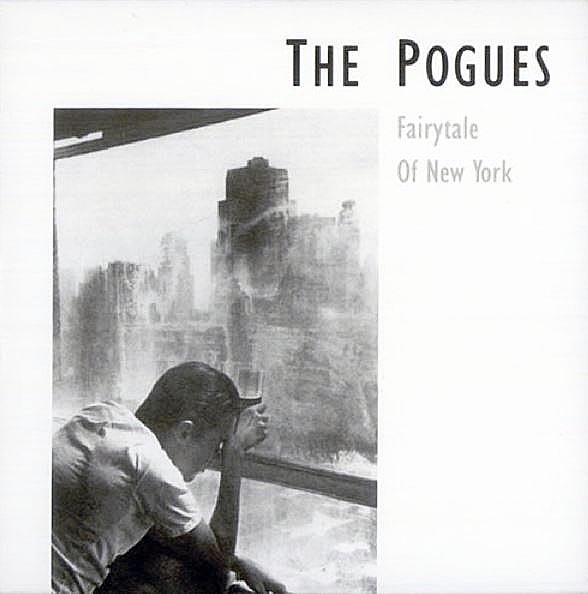 Since its debut in December 1987, ‘Fairytale of New York’ has become an essential Christmas song. 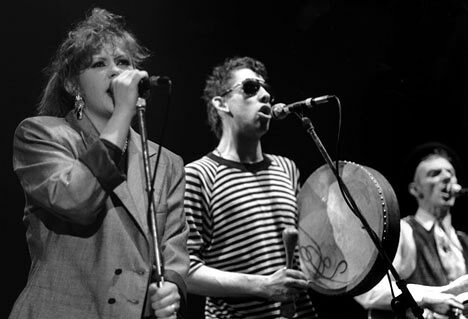 Telling the tale of two Irish immigrants and their estranged love life in the American metropolis, the bittersweet ballad was famously performed by The Pogues’ frontman, Shane MacGowan and singer, Kirsty MacColl. Kirsty MacColl with the Pogues. Kirsty MacColl was a south London girl, born in Croydon on 10th October 1959. 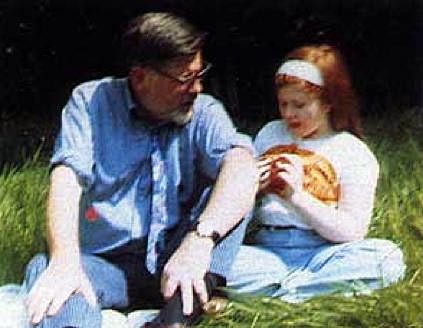 Her father, Ewan MacColl was a folk singer, best known for writing ‘The First Time I Ever Saw Your Face’ which was popularized by Roberta Flack in 1972. Sadly, the record’s release coincided with a strike by the label’s distributor which bogged down promotion and sales. Kirsty’s first tune became better known a few years later when it was covered in 1983 by Tracy Ullman; the Slough-born comedian whose television show would later go on to give birth to The Simpsons. 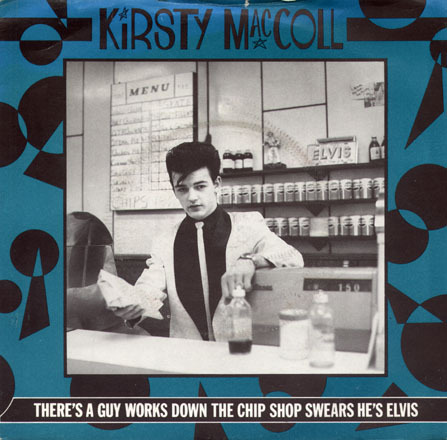 In 1981 Kirsty MacColl had better luck with ‘There’s a Guy Works Down the Chip Shop Swears He’s Elvis‘ which reached number 14 in the charts. The promotional video for the song, which was filmed around London and includes shots of Battersea Power Station, Little Venice and the Alexandra Road estate near Abbey Road, can be viewed below. Nevertheless, despite missing out on the top spot in 1987 Fairytale of New York has become firmly entwined in the festive season. In 2012, an ITV special had the song voted the nation’s favourite Christmas tune. The famous song can be heard below; please click to listen. Over time, Kirsty began to develop a passionate knowledge of South American music, going so far as to learn Spanish in order that she could gain a better grasp of the genre’s lyrics. In the autumn of 2000, after playing what would prove to be her last ever gig at Shepherds Bush Empire, Kirsty travelled to Cuba to record a documentary on the region’s music for BBC Radio 2. 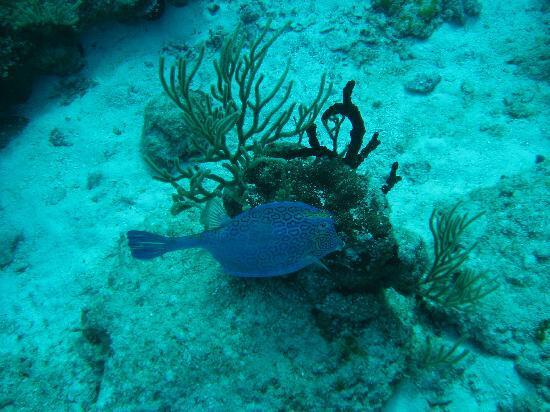 Once the work was complete, she moved onto Cozumel; an island off of Mexico popular with scuba divers where she planned to spend a holiday with her two boys and her partner, James Knight. On the 18th December 2000, Kirsty and her sons went swimming amongst the Chankanaab Reef; a beautiful area of water designated for diving and from which boats are strictly permitted from entering. Despite the restriction, a speedboat unexpectedly tore into the area whilst Kirsty and her boys were surfacing from a dive. Jamie (then aged 15) was in the direct path of the craft and Kirsty managed to quickly push her son out of harm’s way… but she was unable to safe herself. The boat struck Kirsty, killing her instantly. It soon transpired that the boat involved in the fatal accident belonged to Guillermo Gonzalez Nova; a millionaire and Mexican supermarket magnate who was on-board with his family at the time of the incident. The blame was placed upon one of Gonzalez Nova’s employees- Cen Yam; a young deckhand who stated that he was at the controls at the time Kirsty was struck… despite the fact that Cen Yam did not hold a licence to drive such boats and eyewitnesses to the tragedy claimed they did not see him at the controls. Cen Yam was sentenced to two years in prison; a stretch which he managed to avoid by paying the paltry fine of 1,034 pesos…approximately £63. Shortly after her death, a memorial to Kirsty was held in St Martin in the Fields church, Trafalgar Square. 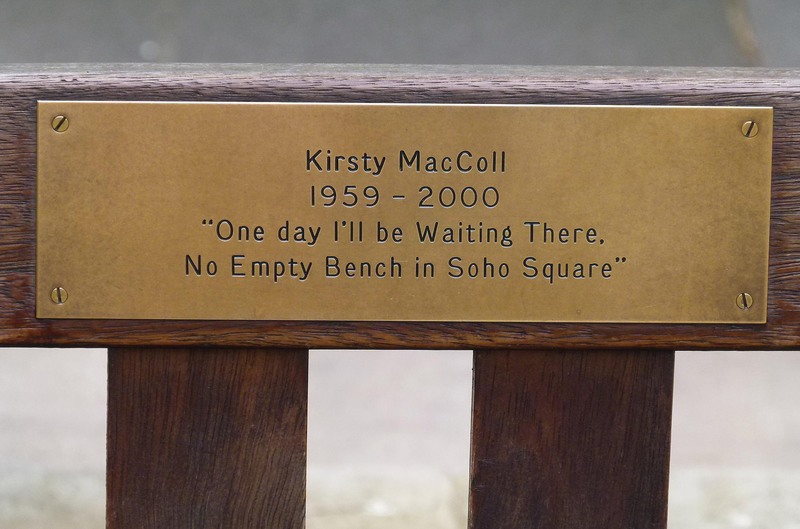 On 12th August 2001, a bench dedicated to the late singer was unveiled on the southern side of Soho Square in the presence of Kirsty’s mother, Jean MacColl who has fought so hard to find justice for her daughter. 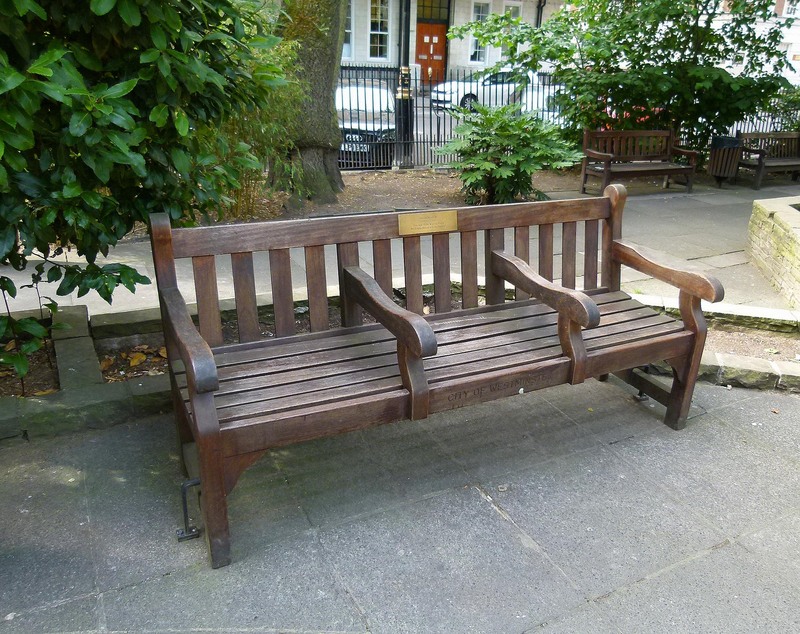 Kirsty MacColl’s memorial bench can be found on the southern side of Soho Square, towards the corner facing Greek Street. Every year on the 10th October Kirsty’s friends and fans gather at the bench to celebrate her birthday, life and the creativity which were so tragically cut short. ‘Soho Square’ can be heard below.